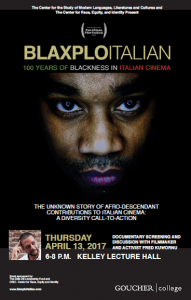 Mr Kuwornu will be at Goucher for the screening of his latest documentary “Blaxploitalian: 100 years of Blackness in Italian cinema” about diversity in the film industry, uncovering in particular the struggles of African-Italian actors in Italy. After the screening our guest will welcome questions and tell his own personal story, hopefully initiating an interesting discussion with our community. The screening is graciously sponsored by Lectures and Fellowship and The Center for Race, Equity and Identity.